Mansion on the Hill: Do All-Age trials and dogs still matter? Thanks to acclaimed outdoor writer and Editor-at-Large for Pointing Dog Journal, Tom Davis for writing this 2-part story at my suggestion 🙂 about All-Age dogs. And thanks to PDJ Managing Editor, Jason Smith for taking such an interest in the story. He promised to give me a whopper of a photo credit in Part II 🙂 All the photos are by your humble Strideaway editor. Part II contains interviews with field trial dog men, Rich Robertson and Frank LaNasa. 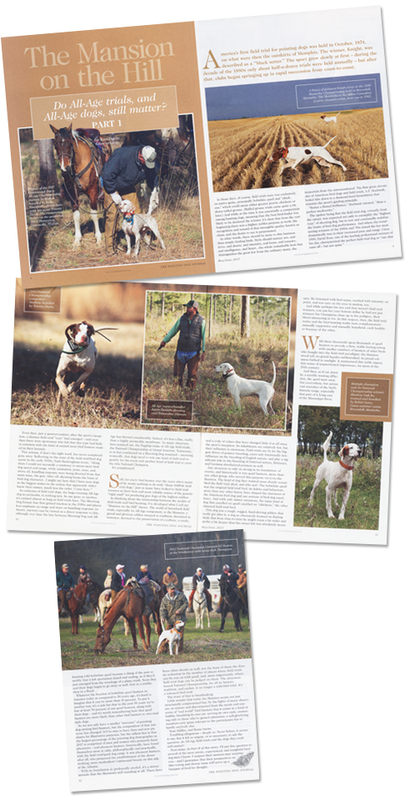 Part I (above) appears in the current May/June issue of Pointing Dog Journal. Part II will appear in the (next) July/August issue. Subscriptions and Back Issues are available at PDJ Storefront. Single issues are also available at some bookstores. Google it!